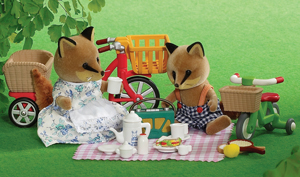 Fox mother Roxy Renard and her son Baden enjoy cycling to peaceful picnic spots by the river. Before they eat they play bat & ball to work up an appetite. Set includes brother Baden and mother Roxy Renard and all the accessories you see here.